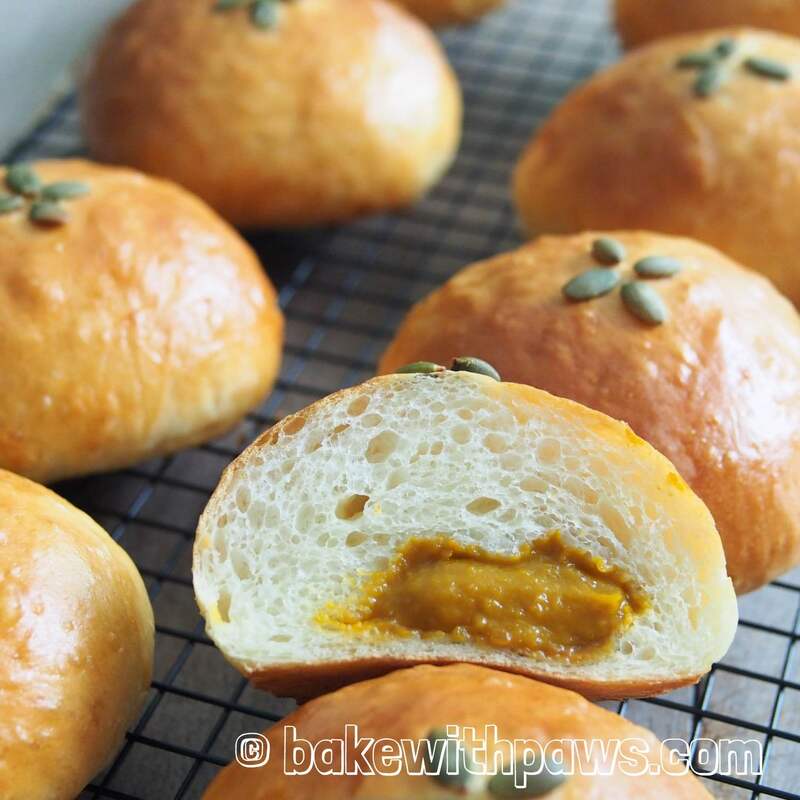 I love making Pumpkin Kaya as it is so much easier to prepare and probably healthier too. I made a lot recently as we had a few large pumpkins at home. I always like to make bread dough either using the Tangzhong (water roux) method or the overnight sponge dough method. It may seem like more work than the straight dough method but I have found that it yields a better, soft and fluffy bread. In this recipe, I use the Tangzhong method. You may also use overnight dough method if you prefer, for that recipe please click here. 2 baking trays & round silicon mold or ice cube mold. Freeze the pumpkin kaya in ice cube mold or small round silicon mold for at least 8 hours. Make 10 frozen pumpkin kaya cubes, about 1 ½ tbsp of pumpkin kaya each. Remove from heat and transfer to a clean bowl to let it cool. Tangzhong can be used straight away once it cools down to room temperature. It can be stored in fridge up to a few days The chilled tangzhong should return to room temperature before using. Line the baking pans with parchment paper. Add all ingredients (start with salt, flour, yeast, sugar, milk powder, butter, egg, fresh milk and lastly tangzhong) into the bowl of stand mixer. Using the dough hook on a stand mixer, knead until the dough comes together, become elastic and tacky but not sticky. Tacky dough behaves sort of like a Post-it note, sticking to a surface but peeling off easily. It takes around 15 minutes at medium speed. Start with 90g of milk first, if the dough is too dry, add 1 tablespoon of milk at a time. Let it rise in a warm place for 1 hour or until double in size in a large greased bowl, covered with cling film or kitchen towel. I normally leave the dough in the stand mixer’s bowl and cover with kitchen towel. Punch down the dough to release the air. Transfer the dough to a clean floured surface then divide into 10 equal portions. Shape each dough into a ball. Flatten the dough and roll into a flat circle. Place the frozen pumpkin kaya in the centre, wrap and seal. Place the buns in the prepared baking pan. Let it rise for another 60 minutes or until double in size. Fifteen (15) minutes before baking, turn on the oven to 180C. 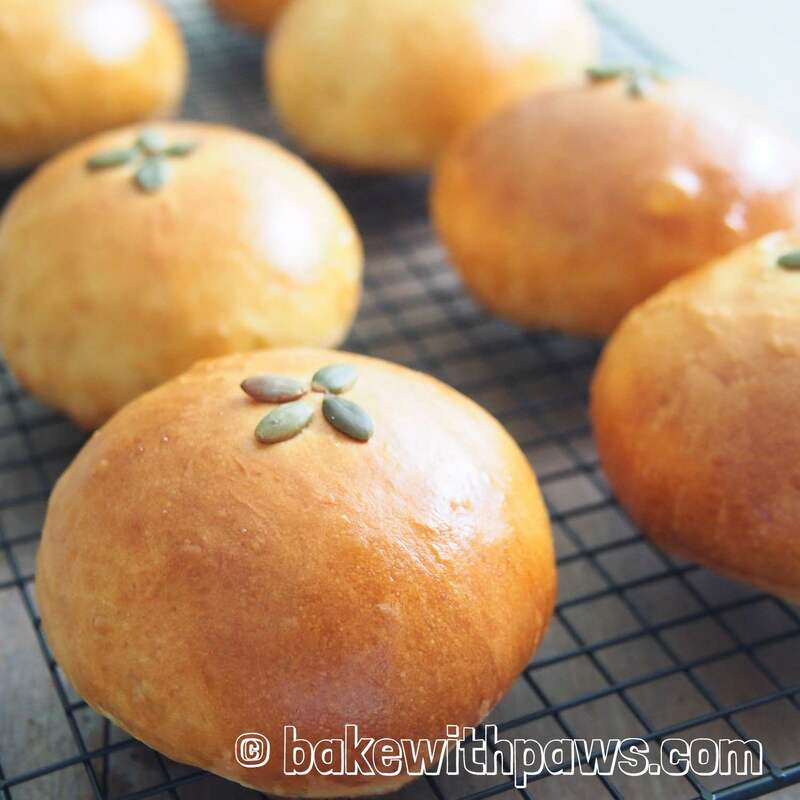 Brush with egg wash and top with pumpkin seeds. Bake in a preheated oven for about 15 - 20 minutes or until golden brown.